We are a competition venue for people wanting to improve their skill set in long range shooting. The natural Alabama terrain lends itself to a competitive shooting atmosphere unlike other areas in the Southeast. We are home to the Alabama Precision Rifle Challenge, the only PRS sanctioned match in the state of Alabama. We also host many one day precision events called "Shooter's Challenge". The match directors have a vast knowledge and experience in shooting PRS matches all over the nation. This will guarantee a fast tempo, competitive match that will most definitely be a challenge! While Alabama Precision is committed to providing the experienced shooter with a high level of competition we are equally committed to creating a welcoming environment to new shooters. We hope you will consider shooting with us. The Alabama Precision Rifle Challenge will be a two-day competition. Stages will be laid out in a manner to test all facets of a shooter's skill set. Shooters should expect to fire between 150-200 rounds over the two-day competition. While the Rifle Challenge is a Precision Rifle Series points event, it is just as welcoming to the recreational long range shooter. Shooters can expect to engage targets from 100 to 1200 yards in a natural terrain environment. Once again we will have a tune up day on Friday. Shooters will be able to shoot from 10am to 3pm on the mover, barricades, etc. out to 1200 yards. For this reason, the COF will not be made available to the shooters until they are ready to leave the property on Friday. The match directors have a vast knowledge and experience in shooting PRS matches all over the nation. This will guarantee a fast tempo, competitive match that will most definitely be a challenge! Registration will be from 10:00am to 6:00pm Friday. If you cannot register during this time frame you will need to email us to make other arrangements. From 10:00am to 3:00pm the range will be available for those who paid for the “tune-up”. If you did not pay for the “tune-up” and want to shoot you may pay the $50 at registration. For those who did not pay for the “tune-up” we will have an area for you to check your 100 yard zero. Finally, we will be having a vendor demo day located next to the zero range/ range parking area and it is open to everyone. You guys will be receiving an email from Practiscore to self-squad. It may appear as SPAM but it is not. Please take the time to squad yourselves and make note of what squad you are in. You will need this information for the match and we will not be squadding the day of the match. Alabama Precision runs a cold facility. This means under no circumstances should you ever have a loaded firearm at our match unless you are instructed to do so by the RO. There is no pistol in this match so it will not be necessary to carry a sidearm while on the property. Please leave them in your vehicle. If you feel you need to keep a loaded sidearm, please contact us ahead of time for approval. You are responsible for knowing your dope. This is not the place to run your buddy's dope and try to figure it out as you go. If we do not see trace, impacts on steel or dirt hit around the target you are engaging you will first get a warning then you will be called off the stage. Everyone, take the time to run your speed, bullet, etc through a ballistics app at the very least. We are unable to offer refunds. You may sell your slot to another shooter if you wish. The Alabama Precision Shooter's Challenges will be one-day matches with a high emphasis on fun! Shooters are encouraged to not only help each other, but also learn from fellow competitors. While it is a competition, the main goal is to welcome newer shooters and create a learning environment for all participants. It will be fun and challenging for the new shooter, as well as the more experienced shooters. Target engagements will be from 100 to 1200 yards. This competition will count for PRS one-day match points. These matches also count towards the PRS Club Series for the Southeastern Region Yearly Points Race Series. Check out the PRS Club Series website and the PRS Club Series Guidelines for more information. Note: It is not required that you be a PRS member to shoot this match. However, if you wish to have your points tracked for the year, you will need to register a free account with the PRS. Alabama Precision runs a cold facility. This means under no circumstances should you ever have a loaded firearm at our match unless you are instructed to do so by the RO. There is no pistol in this match so it will not be necessary to carry a sidearm while on the property. Please leave them in your vehicle. If you feel you need to keep a loaded sidearm please contact us ahead of time for approval. Course descriptions will be given out at registration but plan on shooting 80-100 rounds. There are no special gear requirements. This is a very new shooter friendly match that is designed to be shot with minimal gear, with that said certain stages might limit gear but as a general rule we will not limit you. ECIs (Empty Chamber Indicators) will be required when the shooter is not on the firing line. If you do not have one, we will provide you with one. In addition to the ECIs check with the RO for the designated "safe direction" at every stage. For the 2018 Shooter's Challenge Matches we will have traveling RO's. Due to the tight time schedule, ROs will instruct shooters when they may retrieve their brass. Everyone will be walking between stages but if you have any physical limitations let us know and you will be permitted to drive. Water will be available but feel free to bring any snacks you might want. The Alabama Precision FGMM (Federal Gold Metal Match) will be a two-day competition. Stages will be laid out in a manner to test all facets of a shooter's skill set. Shooters should expect to fire between 150-200 rounds over the two-day competition. The FGMM is a Precision Rifle Series Pro Series Qualifier event. 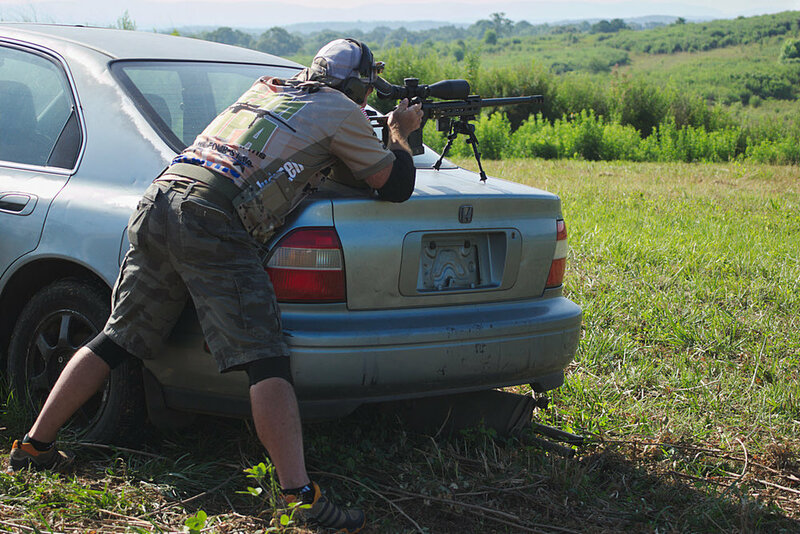 Shooters can expect to engage targets from 100 to 1200 yards in a natural terrain environment. We will have a tune up day on Friday. Shooters will be able to shoot from 10am to 3pm on the mover, barricades, etc. out to 1200 yards. For this reason, the COF will not be made available to the shooters until they are ready to leave the property on Friday.